www.royalpacific.com is a Site operated by Royal Pacific Realty Group (“Royal Pacific”). Access to the Sites is permitted on a temporary basis, and Royal Pacific reserves the right to withdraw or amend the information and services it provides on the Sites without notice (see below). Royal Pacific will not be liable if, for any reason, the Sites are unavailable at any time or for any period. From time to time, Royal Pacific may restrict access to entire Sites or to some parts of them, to users who have registered with us. Royal Pacific is the owner or the licensee of any and all trademarks, logos, service marks or other intellectual property (collectively, the “IP”) contained in, or displayed on, the Sites and the material published on them. The IP is protected by copyright and other laws and treaties around the world and you are prohibited from using the IP for any purpose including, but not limited to, use as meta tags on other pages or sites on the World Wide Web without our written permission or such third party which may own the IP. You may print off one copy, and may download extracts, of any page(s) from the Sites for your personal reference and you may draw the attention of others within your organization to material posted on the Sites. You are prohibited from modifying, copying, distributing, transmitting, displaying, publishing, selling, licensing, creating derivative works or using any of the IP for any purpose, whether in paper or digital format, except as otherwise explicitly permitted hereunder, provided that you are prohibited from using any illustrations, photographs, video or audio sequences or any graphics separately from any accompanying text. In all cases, Royal Pacific’s status (and that of any identified contributors) as the authors of material on the Sites must always be acknowledged. All commentary and other materials posted on the sites are provided by us are provided “as is” without warranty of any kind either express or implied including, but not limited to, the implied warranties of merchantability and/or fitness for a particular purpose, title, non-infringement or accuracy. We do not endorse and are not responsible for the accuracy or reliability of such commentary, materials or any opinions, advice, or statements contained on the sites, or the capabilities or reliability of any product or service referred to, discussed or provided by us. Under no circumstances will we, our affiliates, agents, shareholders and/or directors (the “Royal Pacific Group”) be liable for any loss or damage caused by a reliance on information obtained through the sites or a linked site, or reliance on any commentary, opinions, advice, statements, products or services obtained from us. Royal Pacific Realty Group aims to update the Sites regularly, and may change the content at any time. If the need arises, Royal Pacific may suspend access to the Sites, or close it indefinitely. Any of the material on the Sites may be out of date at any given time, and Royal Pacific is under no obligation to update such material. YOU AGREE THAT UNDER NO CIRCUMSTANCES WILL WE LIABLE TO YOU OR ANY OTHER PERSON OR ENTITY FOR SPECIAL, INCIDENTAL, CONSEQUENTIAL, PUNITIVE, EXEMPLARY, DIRECT OR INDIRECT DAMAGES, LOSS OF GOODWILL OR BUSINESS PROFITS, WORK STOPPAGE, DATA LOSS, COMPUTER FAILURE OR MALFUNCTION OR ANY AND ALL OTHER COMMERCIAL DAMAGES OR LOSS. TO THE EXTENT PERMITTED BY LAW, ROYAL PACIFIC REALTY GROUP HEREBY EXPRESSLY DISCLAIMS ANY AND ALL CONDITIONS, WARRANTIES AND OTHER TERMS WHICH MIGHT OTHERWISE BE IMPLIED BY STATUTE, COMMON LAW OR THE LAW OF EQUITY. You may link to Royal Pacific’s home page, provided you do so in a way that is fair and legal and does not damage Royal Pacific’s reputation or take advantage of it, but you must not establish a link in such a way as to suggest any form of association, approval or endorsement on Royal Pacific’s part where none exists. You must not establish a link from any website that is not owned by you. The Sites must not be framed on any other Sites, nor may you create a link to any part of the Sites other than the home page. Royal Pacific Realty Group reserves the right to withdraw linking permission without notice. If you wish to make any use of material on the Sites other than that set out above, please address your request to info@royalpacific.com. Where the Sites contain links to other websites and resources provided by third parties, these links are provided for your information only. Royal Pacific Realty Group has no control over the contents of those websites or resources, and accepts no responsibility for them or for any loss or damage that may arise from your use of them and Royal Pacific Realty Group makes no representations or warranties or endorsements in respect of the information, products or services presented in any third party resources or websites. 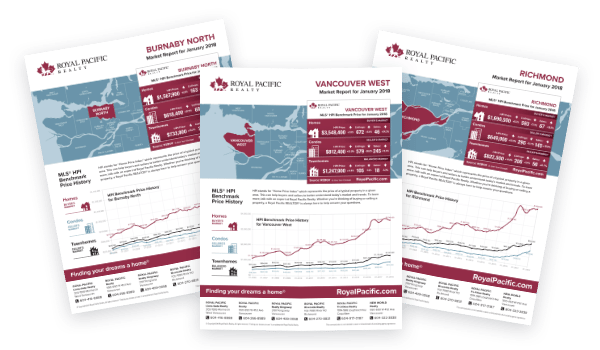 The Sites are operated and controlled by Royal Pacific from our offices located within the Province of British Columbia, but can be accessed from jurisdictions whose laws may differ from those of the Province of British Columbia. By accessing the Sites, you agree that the laws of the Province of British Columbia and the laws of Canada applicable therein shall govern as to the interpretation, validity and effect of these Terms of Website Use notwithstanding any conflict of laws provisions or your domicile, residence or physical location. You agree that if you access the Sites outside of the Province of British Columbia, you are responsible for compliance with local laws. You consent and submit to the exclusive jurisdiction of the courts of the Province of British Columbia in any action or proceeding instituted under or related to these Terms of Website (including, but not limited to, a breach thereof), your use of the Sites, and/or any other proceeding involving us, either directly or indirectly.